Globally respected and influential author, keynote speaker and futurist. Barton is the author of three books. His latest – The Definitive Guide to Social CRM (Pearson, 2015) – deals with the impact of Social Media and its integration with CRM. 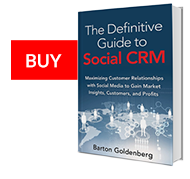 His latest book provides powerful new tools that will leverage the interplay of Social Media with CRM. Barton is presently writing a fourth book, Engaged Customer Strategy: Your Roadmap to 2030, for publication in 2018. Barton is founder and President of ISM Inc., where, since 1985, he has designed and implemented customer-centric strategies in the areas of sales, marketing and customer service. – and one of the first three inductees into the CRM Hall of Fame. The world’s best private, public and non-profit organizations have engaged ISM to guide them in the successful implementation of these strategies.